It was tough, it was tight but Fairlands Valley Spartans came from behind and won promotion to division one in the last race of the Mid Week League series of evening 10K races. They started the night one point below the promotion zone and finished one point ahead of third placed club Bishops Stortford by 33 to 32. Crucial to this was the men’s team in second place beating Bishops Stortford by 308 race places to 317, just nine places, and the women’s team in third beating the same club by just 92 to 98, only six places. Every Spartan runner, man or woman, made a difference. The whole men’s “A” team of twelve runners finished in the top seventy places. Ten of them beat the forty minute barrier on the course, from Ridlins to the top of Fairlands Valley Park and back, that was tough for the first five kilometres. ANDREW PATTERSON led in the Spartan charge for promotion with seventh place and 35 minutes 52 seconds; CRAIG HALSEY was ten seconds behind at eighth and 36:02; next came GRANT RAMSAY at eleventh and third veteran with 36:19. BRIAN BRACKSTON ran his best 2017 10K at 14th place with 36:33; SIMON JACKSON was 25th in 37:53; RICHARD BATE 34th in a season’s best 38:27; MIKE GREEN 38th in 38:45; STEVE GREEN 57th in 39:52; DAVID RIDDELL 59th in 39:59; STUART HAYCROFT 62nd in 40:03 and new member CHRIS TILLBROOK 69th in 40:37. Fairlands’ top two females sprinted hard for the line with NUALA ROBINSON sixth woman in 43:25 improving her personal best by 27 seconds to 43:25 and ASHLEY SCHOENWETTER seventh with a new PB of 43:18. SUZY HAWKINS was a top ten finisher in 44:09. The women’s “A” team of six runners was completed by ISABEL GREEN running her best 2017 time which was 46 minutes, RUTH REILLY taking a 2 minutes 34 minutes chunk off her already good PB to finish in 46:11 and HANNAH NEALE running through the field to 48:30. But there were a stunning seventy six Spartans in the race, 27 women and 49 men, all of them contributed and many of the other 58 helped to push other clubs down the finish order. For example the women’s “C” team finished ahead of the “A” teams from two other clubs. Other great performances included GARETH COWELL running a 45:27 PB, an improvement of 1 minute 1 second; VERITY FISHER was delighted to cut her 10K time by 1:07 to 48:30; ROS INGRAM took 56 seconds off to 48:40; HAZEL SMITH also by 56 seconds this time to 49:21; LAUREN DEIGHTON trimmed two seconds to 49:20; KERSTIN WEINER leapt forwards with a 2:33 cut to 50:10 and JULIE SIMMONS was second in the veteran women (55 plus) race with 52:15; MICK ANDREWS improving by 2:44 to 55:48 and CLAIRE HYDE squeezing off another 3 seconds to 56:46. 58 BRIAN WHITE 39:55 2MV60. “A” team. 59 DAVID RIDDELL 39:59 2MV50 (SB 0:19). “A” team. 62 STUART HAYCROFT 40:03 PB (1:03). “A” team. 69 CHRIS TILLBROOK 40:37 YB (0:50). “A” team. 76 LIAM HERBERT 41:07 SB (0:50). “B” team. 87 MARK COLLINS 42:03 PB (1:03). “B” team. 88 TIM SABAN 42:07 “B” team. 91 THOMAS SAUKA 42:25 “B” team. 92 DEAN CARPENTER 42:30 “B” team. 104 BARRY OSBORNE 43:18 3MV60. YB (0:02). “B” team. 107 NUALA ROBINSON (F) 43:18 6th woman. PB (0:27). “FA” team. 108 ASHLEY SCHOENWETTER (F) 43:18 7th woman. PB. “FA” team. 109 TODD GRAY 43:36 “B” team. 110 PETE SMITH 43:40 YB (0:41). “B” team. 118 SUZY HAWKINS (F) 44:09 7FV35. 10th woman. “FA” team. 127 NICK GILL 44:57 “B” team. 136 GARETH COWELL 45:27 PB (1:01). “B” team. 142 JOHN NELMS 45:30 “B” team. 151 PAUL MAGUIRE 45:52 YB (1:11). “B” team. 152 MARK GOODWIN 45:46 “C” team. 159 ISABEL GREEN (F) 46:00 YB (0:25). “FA” team. 163 RUTH REILLY (F) 46:11 PB (2:34). “FA” team. 165 DARREN EMMERSON 46:24 “C” team. 190 GREG KELLY 48:07 YB (1:32). “C” team. 194 MATT GILL 48:20 SB. “C” team. 197 HANNAH NEALE (F) 48:26 “FA” team. 198 JAMES KILROY 48:26 YB (0:45). “C” team. 201 VERITY FISHER (F) 48:30 PB (1:07). “FB” team. 203 PAUL BATTERBEE 48:30 “C” team. 206 ROS INGRAM (F) 48:40 PB (0:56). “FB” team. 212 CLAIRE EMMERSON (F) 49:11 7FV45. “FB” team. 215 HAZEL SMITH (F) 49:21 PB (0:56). “FB” team. 216 JULIET FULLWOOD (F) 49:21 “FB” team. 220 LAUREN DEIGHTON (F) 49:20 PB (0:02). “FB” team. 223 KEN JUDE 49:28 “C” team. 231 JIM BROWN 49:51 8MV60. “C” team. 234 VISHAL SHAH 50:14 YB (2:41). “C” team. 237 KERSTIN WEINER (F) 50:10 PB (2:33). “FC” team. 247 ANDY PRIOR 50:57 YB. “C” team. 254 ANDY JAY 51:22 YB (0:12). “C” team. 257 DAVE SMITH 52:03 YB. “C” team. 259 HAYLEY BIRONNEAU (F) 52:03 YB (1:14). “FC” team. 261 JULIE SIMMONS (F) 52:15 2FV55 (YB 1:34). “FC” team. 267 KAREN ELLIS (F) 52:49 “FC” team. 269 LISA GRAY (F) 52:47 “FC” team. 271 JENNY GARRETT (F) 52:41 “FC” team. The friendly Mob Match will be in Welwyn Garden City on Thursday evening 13th July. 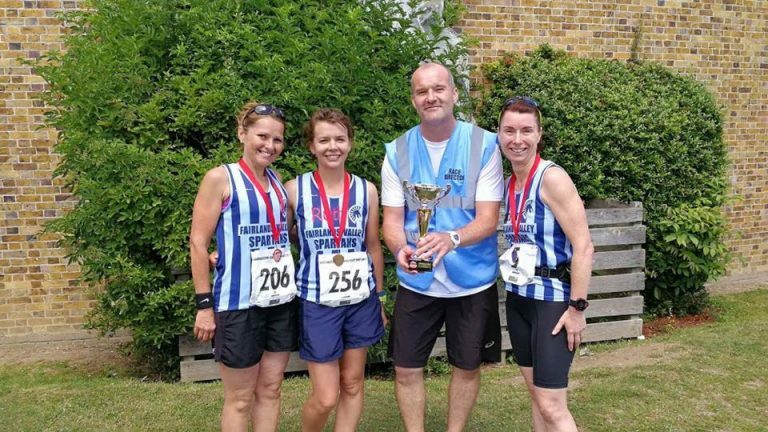 Fairlands Valley Spartans team of nine women impressed at Sunday’s Bassingbourn Half Marathon. RUTH REILLY, KAREN ELLIS and JENNY GARRETT won the women’s team race with a total of 5 hours 46 minutes 36 seconds with Ruth 53rd overall in 1:43:26; Karen 160th in 2 hours 1 minute exactly and Jenny 165th overall in 2 hours 2 minutes exactly. It was warm again with a breeze but VICTORIA BRETT ran a new half marathon personal best of 2 hours 2 minutes 42 seconds. Four more Spartan women paced each other round and came in together – JULIE SHADBOLT 2:10:46; HAZEL SMITH 2:10:47; CALLIE CHAPMAN 2:10:48 and CLAIRE EMMERSON 2:10:49. New member JULIA WHITE ran her first half marathon in Bassingbourn. She managed to run it in 2 hours 25 minutes 47 seconds despite tearing a calf muscle less than a month ago. Julia only entered because her sister in law had a brain haemorrhage last July and so she wanted to raise money for the Brains Trust charity as it has personal meaning. For the men PAUL MAGUIRE ran a great new personal best (PB) of 1 hour 41 minutes 15 seconds. Completing an extravagant four races in a week JIM BROWN missed first place in his category by a few seconds but was content to beat his target of 1:50 for the event with 1 hour 49 minutes 25 seconds. VISH SHAH came in with 2 hours 6 minutes 55 seconds. TIM SABAN ran the Ickenham Five in 34 minutes 6 seconds and was 27th overall. In steady rain throughout ROGER BIGGS ran the Milton Keynes 10K in 58 minutes 17 seconds. The evening event started in the Open University grounds. Andy Jay was the solo Spartan at the inaugural 5 mile event held on the Woodhall Estate near Watton At Stone. In very hot conditions on a challenging but beautiful course, Andy finished in 44:25. In the heat the organisers did a great job by holding water stations at every mile. This was race one in a midsummer race series hosted by Active Training World. Race two will be in Panshanger Park (near Hertford) on 19th July. After Wednesday’s effort JIM BROWN ran the Serpentine 5K in 25 minutes 13 seconds on Friday but was still second in his category. He was 180th out of the 218 finishers in mild and dry conditions with a light breeze. The reserve course was used due to a Phil Collins concert. The lunch-time event often attracts a quality field. This time the fastest woman finished in 17:43. Jim’s run means he has already completed a qualifying series for the year. For the time being he is twelfth out of many hundreds of runners. THOMAS SAUKA ran the Skiddaw fell race. It was tough but he ran a great time of 1:39:42. On a chilly morning KEITH COUGHLIN was the quickest Spartan at Stevenage parkrun, finishing second in 18mins 15secs. RICHARD SPRINGALL was seventh in 19:10 and NICK GILL finished 20th in 21:08. DANIEL SUTTON (24:49), JON SYPULA (26:17), ROGER BIGGS (28:21), JAMES SOUTH (31:07 with buggy and dogs), SELVAN NAICKER (31:11), TREVOR BROOM (35:23), ROBERT HARDY (36:21) and IAN ALEXANDER (tail-walking in 58:44) were the other men in action. Selvan and Trevor were both notching new course PBs. For the women, CAROL PAUL finished ninth in 26:09, with the next two Spartans being HANNAH SYPULA (28:49, new course PB) and JO BOWDERY (30:30). Both Hannah and Jo were running with dogs. SALLY PHILLIPS (30:59) and PAULINE HARDY (41:50) were the other Spartan women running. EMAC Track and Field at Milton Keynes on Wednesday 5th July. Handicap 5K in Stevenage on Thursday evening 6th July. Mob Match at Welwyn Garden City on Thursday 13th July. Fairlands Valley Relays in Stevenage on Thursday 27th July.